As Mr Bimbamboozle, Chris has the happy knack of winning the confidence of children, his ability to make them laugh, and his gentle but firm control make him popular with kiddies and parents alike, and he is particularly in demand as a birthday party highlight. 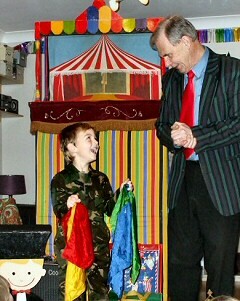 Whether in the home or local community hall Chris brings fun and laughter with magic and Punch & Judy. These domestic shows are designed to involve the children in helping to make the magic. Of course the birthday child is made to feel very special, and is encouraged to assist in a magical feature. Chris is sensitive to the feelings of children and will not press an overly timid child, but it is surprising how even the normally shy ones warm to his encouragement and are eager to be involved. 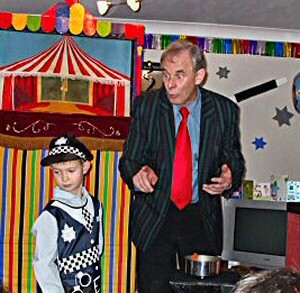 The show normally lasts about one hour, starting with magic which involves a great deal of participation with the children who, when Mr Bimbamboozle gets into difficulties, seem to know just what to do to make the magic work. 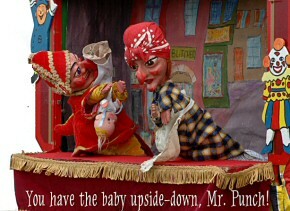 There follows twenty minutes of hilarity and excitement as Mr Punch gets up to his usual naughtiness including making a mess of looking after the baby much to the distress of long suffering Judy, is frightened by the crocodile, and is finally apprehended, with the help of the children, by Mr Policeman and is escorted from the scene. 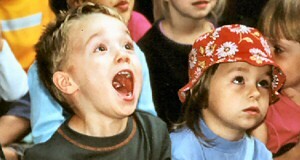 The joyous involvement of the children with the Punch & Judy Show is remarkable. Following the puppet show the magic continues and the usual finale is where a child helper succesfully magically produces enough sweets to be shared by everyone. Chris can adapt his performance to most circumstances and private houses, school classrooms, church halls and leisure centres are frequent party venues.